Today I found myself designing (after colleague Dane requested it) a simple sort of control panel which would allow him to manage his POP/IMAP accounts and mail forwarders on my server. I don’t believe in traditional control panels which waste resources. What I needed to do was build my own and keep it very simple. I didn’t have the time to add feature X and feature Y to it so I concentrated on what was important for myself as well as the people I host. 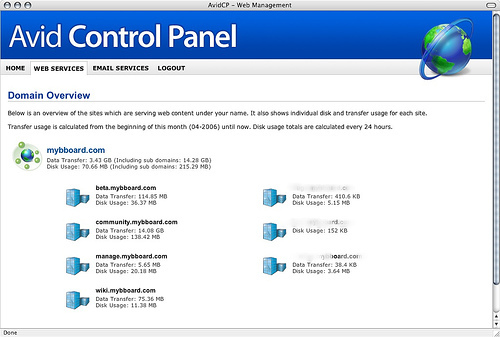 Most importantly would be their disk and bandwidth usage on the server. I’d already designed a framework set of scripts which run via cron jobs every few hours to calculate the disk and bandwidth usage on each account on the server so I just needed to build an interface to access that information. So there we have it – a simple and attractive looking interface which directly presents you with the information you need and no extra “bloat”. It makes use of the Windows Vista icons which really add up making it an attractive layout. I’ll throw up screenshots of the mail management screen when I get around to working on it.